It’s not quite Gondor, but in Gran Canaria there is plenty to see in between the mountains and the sea. 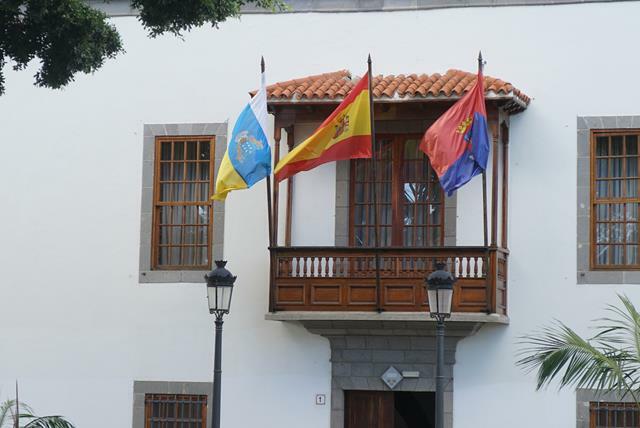 From left to right: the flags of the Canary Islands, Spain and Telde. Telde is the second-largest city in Gran Canaria, after Las Palmas. We headed here straight from the airport and had lunch at Restaurante Segundo, a casual restaurant / bar serving simple Spanish-Canarian fare. It was one of the least touristy restaurants we visited. In true Spanish custom, people started coming in for lunch from about 2pm onwards. There was no written menu and the waiter simply informed us verbally of the menú del día (lunch set meal) options. Definitely good for my Spanish goals! Beef and potatoes for Ian; paella for me. 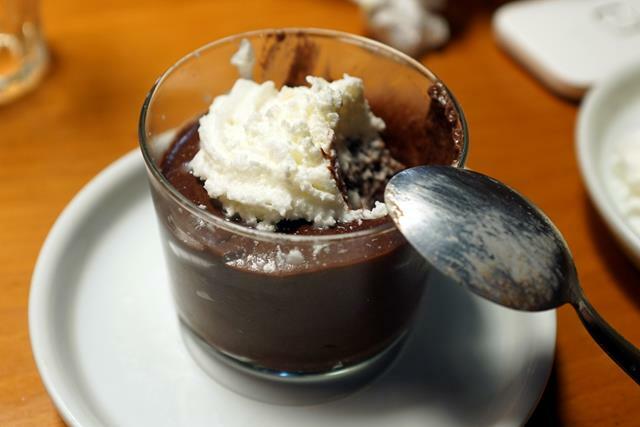 For dessert: chocolate mousse (above) and.. some cake whose name I can’t recall. It was nice! The whole meal cost under EUR8 each. 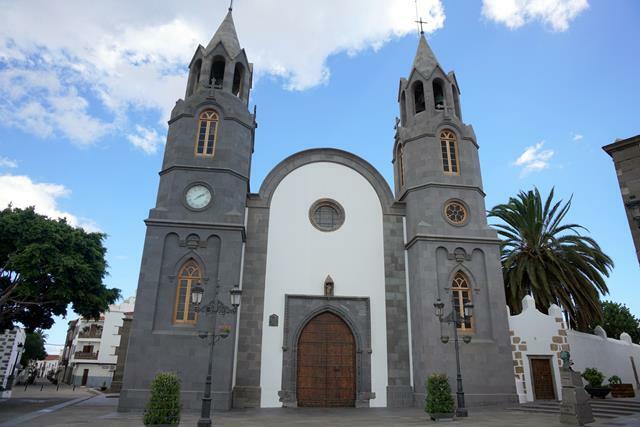 Not far from Restaurante Segundo is this church dedicated to John the Baptist. The exterior is 16th-century Gothic, although the 2 bell-towers were added in the 20th century. I think the street is actually sloping! We didn’t go inside but I wish we had. Above the altar there is a statue of Christ from Mexico made from the pith of corn plants. I’d have loved to see that! The nearest shopping centre from where we stayed in Pozo Izquierdo was Atlántico Centro Comercial in Vecindario, a 5-to-10-minute drive away. We visited a couple of times to eat and get groceries. There are a number of restaurants and (as you’d expect in Spain) they open until pretty late. It was here that I first tried papas arrugadas (“wrinkled potatoes”) con mojo, a Canarian specialty. 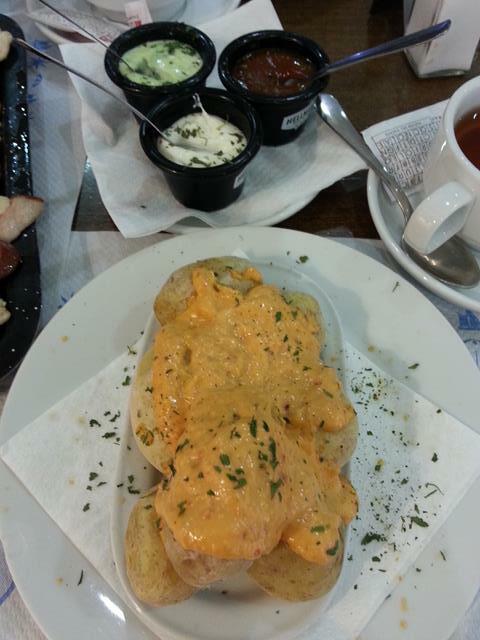 The potatoes are boiled with salt until the skins look wrinkly and there are visible specks of salt. They are served with mojo, a sauce made with a variety of spices. I preferred red mojo, which is spicier than the green version. The mojo here looks yellow but I think it’s supposed to be red… ish. A charming town about 5km west of Arinaga. It was established in 1486(! 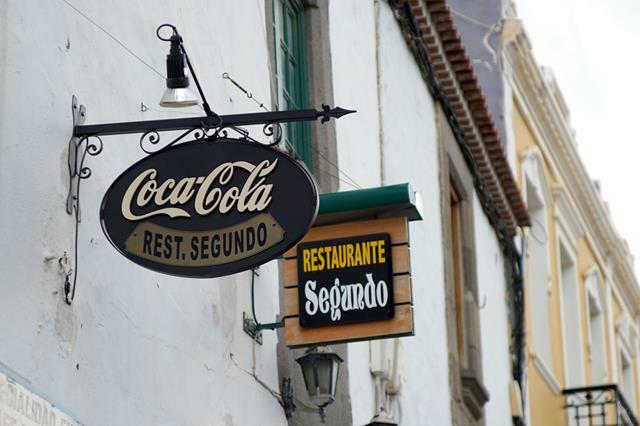 ), making it one of the oldest towns in Gran Canaria. There is a lovely town square (Plaza del Rosario) in the centre of the historic district, surrounded by the very pretty parish church (Iglesia de San Sebastían) and a number of cafes and restaurants. No pictures, unfortunately, as we forgot to bring the camera. It started pouring shortly after we arrived and we took shelter at the nearest restaurant, El Populacho. It doesn’t normally rain much in Gran Canaria, but during our stay it rained so much that there were floods in Las Palmas! No need to do rain dances with me around – in that month alone I weathered (hah) a typhoon in Hong Kong and more rainy weather in Naples. 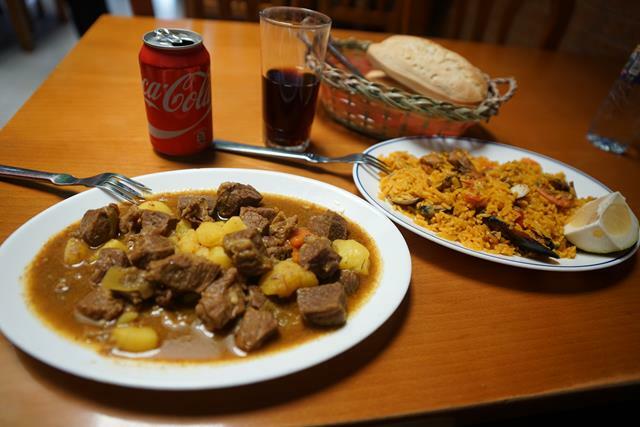 We tried some traditional Canarian tapas at this small and cozy restaurant: Agüimes black pig with papas arrugadas con mojo, and ropa vieja (beef and chickpea stew). You can also get more generally available tapas like jamón serrano. It’s not as fancy as Moorea so portions were bigger and cheaper. Even though we ended up there essentially by accident, I really enjoyed the food and the service. A little north of Agüimes is this nature reserve. Many endemic plants grow here in the valley and you can hike through it. If you drive, it’s well-signposted from Agüimes. We visited for the other unique feature of the valley though – caves! Some are man-made and others are natural. We drove through at night and it was very dark and quiet, save for some twinkling lights from the villages, where people still live. There are also some restaurants, and we had dinner at one. 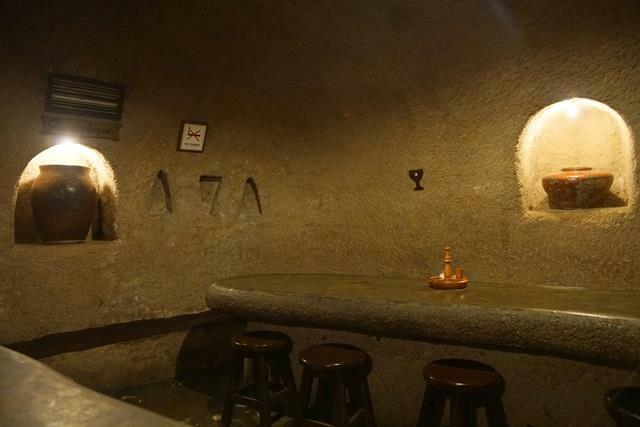 Ever wanted to dine in a cave? Well, here you can. Tagoror is a cave restaurant at the end of the barranco serving tapas and set meals. Go for the tapas if you want a more local selection. We had the set meals and Pulpo de Gallego (Galician-style octopus), which was too much to finish. While eating the octopus I suddenly recalled the ones we saw while diving, including the one which had a camera shoved unceremoniously in its face, causing it to flee and curl tightly up in a crevice. I will never forget the way it looked at us suspiciously from the relative safety of its refuge as we passed by. I’ve had little desire to eat them ever since. For an interesting article on octopus intelligence and whether we should eat them, I recommend checking out this article. Great food (pun totally intended) for thought! Speaking of tapas, it’s recently struck me how you can find the same small-plate-sharing concept across cultures and cuisines. Spanish tapas, Chinese dim sum, Japanese izakayas – aren’t they all essentially the same idea? 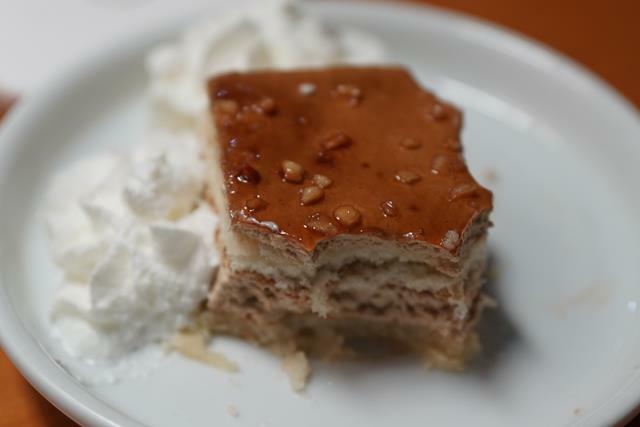 Do you like to tapear (have tapas)? What’s your favourite tapas? Ah, this food looks really yummy, Michelle. I’d love to visit Gran Canaria.